A small drill and center punch. 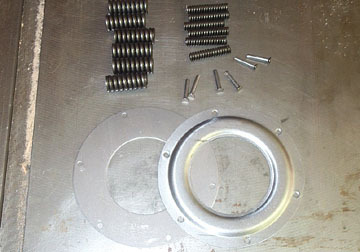 A cush drive repair kit (springs, rivets, and steel top & bottom plates). A new 6302 bearing ( SKF or FAG are good) optional. A rubber mallet or hammer and a block of wood. 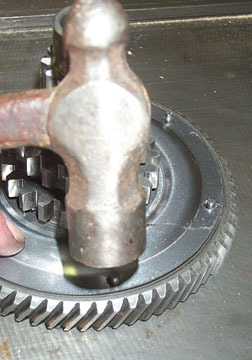 A small flat faced hammer. 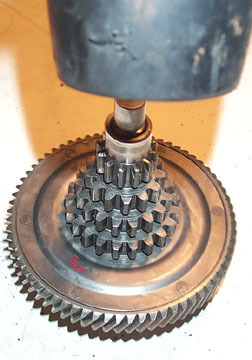 Above is a shot of a primary drive input shaft taken from a PX150. 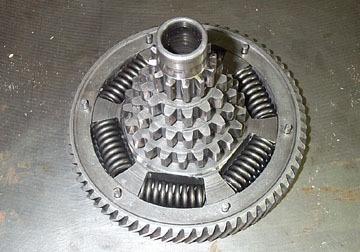 The cush drive is located in between the two metal plates which are held together with rivets. 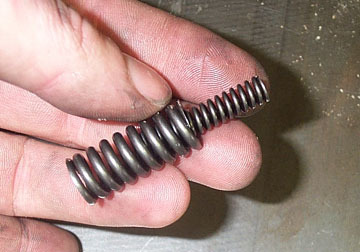 In order to determine if the springs are shot you can sometimes tell by shaking the entire assembly. If you here rattling they are definitely gone and need replacing. 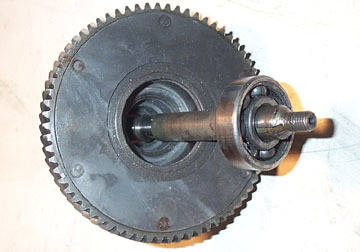 There is also a single bearing within the input shaft which can be removed and replaced if necessary. Since this motor was in bad shape there was a lot of metal bits in the oil and the bearing was shot so I removed and replaced it. 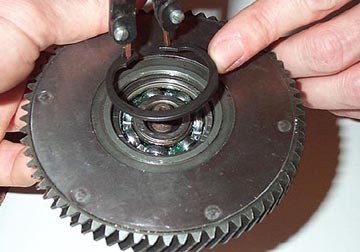 To remove the bearing, use circlip pliers to remove the circlip (snap ring) and then flip the assembly over. Support the primary drive above a flat work surface so that the central shaft is not touching the surface. 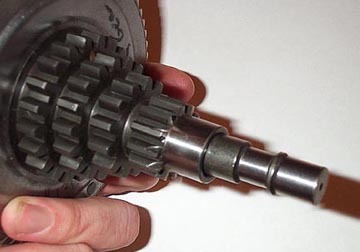 Using a rubber mallet or hammer and wood block, start tapping the shaft down through the gear cluster. 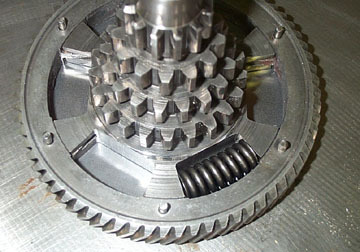 The shaft has a lip that will catch the bearing and force it out of the primary drive. 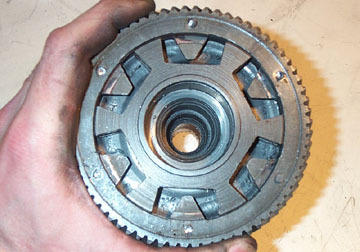 Clean the bearing in gasoline and check it for wear and to see if it turns smoothly. 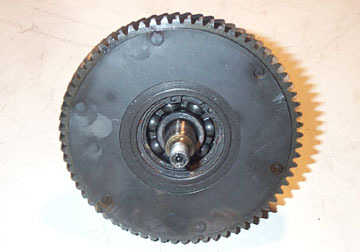 If not it can be replaced after the cush drive springs have been replaced. Carefully center punch each rivet as a starter for drilling out the rivets. Using a drill, drill the heads off each rivet so that the metal face plate can be removed. 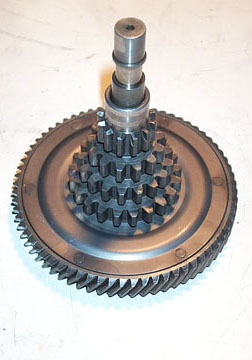 The cush drive replacement kit comes with new steel plates so don't worry about messing them up while drilling. Once the face is separated the (hopefully) broken springs can be removed. Pry out the springs if they don't fall out in pieces like the ones in this drive did. ...and the two parts will come apart. 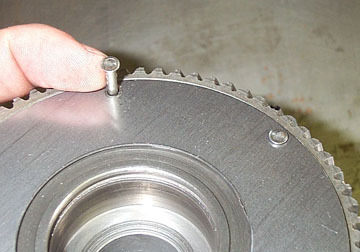 Now you can work on removing the remaining rivets either by using a drill of similar diameter and a drill press, or by using a small punch to punch them out of the primary gear. The primary gear is much tougher steel than the rivets so drilling them without a drill press is another option. 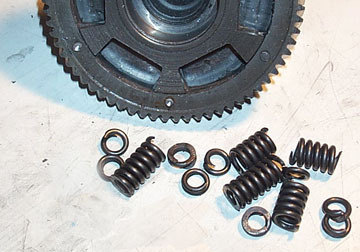 The cush drive repair kit consists of a new backplate (flat) a new front plate (with a bevel), six new outer springs (for 125 and 150cc engines), six inner springs (used in conjunction with the larger springs on 200cc bikes), and six rivets. Start by placing the back steel plate with the slightly countersunk holes facing out. Fit each rivet to the primary and use something like a sheet of cardboard to flip the whole unit over without loosing the rivets, and place it on a hard steel surface. 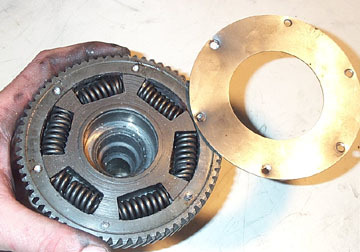 In 200cc motors insert the small spring inside the larger spring. In 125cc and 150cc motors use only the outer spring. 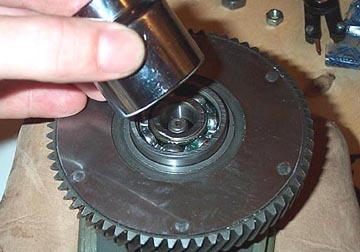 Put the center back in the primary gear and rotate it so the tabs engage. Note that the primary tabs will only connect flush with the primary in one direction. Once the center is in start fitting the springs one at a time. You may need a screwdriver to fit help fit them. Before adding the cover plate, make sure that all the springs are placed correctly and that the rivets are installed and ready to be hammered. 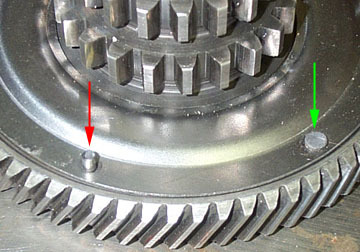 Fit the remaining plate with the bevel facing away from the primary gear. With the bottom of the rivet supported on a hard, flat steel surface, begin to hammer at the exposed end to mushroom it over. Hammer the rivets nice and flat as they rotate very closely to the casing. For contrast you can see the un-hammered rivet shown with the red arrow against the green arrow which is nicely mushroomed flat against the plate. 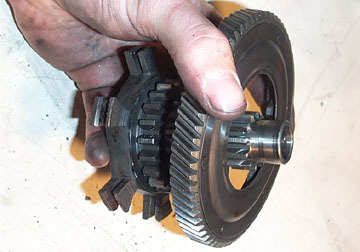 To rebuild the rest of the drive ready for installation in to the motor, first place the shaft all the through the center of the gears. Then support the primary drive with equal sized blocks of wood on either side and use a socket large enough so it only touches the outr race of the new bearing, and hammer it home. Finally reinstall the circlip over the bearing, and the drive is ready to go back in the motor..